The Vindobona EuroCity train has been connecting Berlin with Vienna daily since 1957. But from mid-December this year the route will cease to exist. This service that operated across the Iron Curtain is being seen off by liberalisation and the profit drive of EU railways. The Paris – Berlin night train, the only direct train between the EU’s two founding powers, will be axed at the same time. The Copenhagen Night Train runs for the last time this month. Philip Oltermann tells the story of the decline in The Guardian here. The story about why this is happening is a complicated one, but at its core is the change in the nature of Europe’s railways – from being public services with a public ethos, to competitive, profit making businesses. The EU itself is behind this change, forcing railways to separate their networks from their operations to try to promote competition. This change has worked to a certain extent for rail freight, but when it comes to passengers it means long distance services that run only a couple of times a day, and are borderline profitable, become too complicated and cumbersome to operate and are cut from the timetables. Track access charges – i.e. the cost to a rail company to run a service on a neighbouring country’s tracks – are often cited as the reason. Why then is no-one acting to save these services, and to offer passengers an alternative to flying? My conversations with policy makers in Brussels tend to come up with the rather bland “There’s no political will to fix this” as an answer. I take this as shorthand for “No-one has lobbied me about this issue.” Rail companies and manufacturers do lobby a lot, but passengers do not. The organisation that should work on this issue is the European Passengers’ Federation. The problem is that they have a single member of staff, based in Gent, and they do not seem to actually campaign. Other organisations I have contacted or investigated have no transport policy person (Friends of the Earth EU, Greenpeace EU), do not deal with modal shift to rail (Transport & Environment), do not deal with rail consumer rights (BEUC), or care about EU wide issues but not about rail (European Movement FR and DE). The challenge then is to actually build an organisation, or build a position within an organisation, to be able to work on this issue. I can do what I can as an individual rail traveller using my blog and Twitter to inform people about what is happening, and to pester them about it, but I cannot myself be an organisation that lobbies and campaigns. Complete transparency of track access charges, for all routes, in an open data format. If these charges are indeed the reason cross border services are axed, then we need to know how high the charges are. Partial systems like RNE CIS exist, but as track operators are either public bodies or monopolies full access to all charging information is vital. An EU-wide timetable system. Deutsche Bahn’s Reiseauskunft is the de facto EU-wide timetable, but it is only as good as the data that national operators give it. Italian regional trains are, for example, missing from it, and it also now prioritises DB’s bus services rather than competitors rail services. If you run a train on a track in the EU then the timetable for that train must be made available for all, 3 months ahead of the train’s departure. Full ticketing information for all services, with APIs. If I want to book Amsterdam to Warsaw, or Frankfurt to Kosice, I should be able to get one price from a single website, and for that to include all reduced price tickets. No such website currently exists (despite the efforts of Loco2, Capitaine Train and others), as railways do not systematically make ticket data available in the same way as airlines do. Some trains – like DB’s CNL Night Trains – cannot be booked at all through third party websites. So if you run a train on track in the EU you have to make all ticket data for it available for third parties to use, to allow end-to-end ticket booking to be possible. Make trains as easy to book as flights! Clear rules for what happens when there is a delay. If the train run by one company is delayed, meaning you miss a connection onto a different company’s service, what happens? If it’s a High Speed Train in the Railteam network you should be OK, but if it is not, and especially if you had to book two separate tickets due to the lack of proper booking websites (see point 3 above) you can easily be stuck. Introduce cross border services where tracks exist but services do not. At borders like Ventimiglia, Port Bou, Hendaye and Villa Opicina no through services run, and even changing at the border is complicated due to timetables that are not aligned, or regional services that stop a few kilometres from the border. The EU needs to make a systematic analysis of every cross border line, ranking each, and moving towards the idea of a European core network of passenger services, with stipulations of how often regional and long distance services should run. Examine competition between transport modes. Rail operators – not least in Germany – have long complained that VAT on rail tickets (and not on airfares), coupled with high track access charges, are killing services, especially after the deregulation of the long distance bus market in Germany (see more on InterConnex axing services here). Fair competition when it comes to taxation rates, and access to infrastructure, would be a good start. This is how a sort of manifesto for EU rail passengers could look for the next 5 years, with pressure applied systematically to new Transport Commissioner Violeta Bulc, and MEPs in the Transport Committee. Graphic by Jon Worth. Copenhagen, Barcelona, Madrid, Rome refers to night trains. Wroclaw and Vienna refers to day trains. Made with Creative Commons images – DSC01196 by taschenschieber, TrenHotel Chamartín by VivirElTren.es, Maarsbergen 1778 CNL 404473 uit Kopenhagen by Rob Dammers, PKP Cargo SU46-037 / 5 630 013 in Cottbus by Tegeler and BB 36007 Fr B It & Rame Thello entière by 8Uhr. Well, EPF is trying, but they’re a relatively new player on the European lobby field, and as you say, with only one paid person in Ghent, and some volunteers. They need to be bigger to have some clout, but as they’re relying on limited European subsidies and their member organisations’ contributions, often not very richt themselves, it’s hard. Still, I hope they can get something done, they had some useful contacts with the previous Commission and in the ERA. The list you set up, is about the same they’ve assembled. What are the email lists you’re on regarding these matters and how might one get on them? It sounds like we definitely need to meet up in the early new year to discuss Train2EU! We’re still taking baby steps at the moment but we’ll start gaining traction in January as we’ve got a set of follow-up meetings planned in Brussels to tackle the very issues you’ve laid out here. Also, look for us in the January issue of RGI, which will be publishing our manifesto and “announcing” us to their audience. We’ll definitely be keeping in touch. Great post, and great ideas! I wanted to clarify one thing: “Some trains – like DB’s CNL Night Trains – cannot be booked at all through third party websites”. This is not strictly true. At Loco2 we can sell the CNL but only as postal tickets (rather than print-at-home, which everyone now expects), and only at prices in excess of those available at bahn.com. Also the booking tech is so old and unreliable that it fails a lot of the time. DB and others appear to have stopped investing in night train booking infrastructure and so customers experience problems as described, and so give up and book high-speed or air alternatives. So it’s a chicken-and-egg issue, as without the investment, demand will go unmet and decline will continue to appear inevitable. I believe that http://www.shift2rail.org could be a good opportunity to use public money to make these investments, and here at Loco2 we’d been to help improve night train and other booking functionality as part of a wider context towards the goals you outline above. So if there are any organisations out there wanting to partner with us on that basis, we’d be happy to hear from you. It was published in 2010 but I believe it is still the most comprehensive survey to date. Regarding the EU-wide timetable data, you would need to involve the UIC http://uic.org who compile each month a dataset known as Merits http://www.uic.org/spip.php?article2223. The Merits data then feeds into journey-planning engines like Hafas, which is the software behind the powerful functionality of Deutsche Bahn’s website. Note that the routing assumptions you refer to (e.g. prioritising bus connections over trains) relate to configuration of Hafas, rather than the content of the raw data. There have been moves from the EU (as part of http://tap-tsi.uic.org) to make Merits more “open” but this appears to have stalled somewhat because TAP-TSI has such a wide remit, and because of lack of engagement/appetite to tackle such a complex subject from the rail operators (known as “Railway Undertakings”, “RUs” in EU-speak). Keen to see how you progress this forward and stay in the loop. This situation is precisely where the EU is supposed to be useful. We have 28 member states leaving their own rail companies to make their own way across what is a real common market, but find only cross-border obstacles. The EU is supposed to harmonise trading conditions so this industry can operate seamlessly. Ever since I understood climate change cross-Europe night trains have been my primary means of long distance travel. There must be a way to legislate to make it more profitable to run international services and if seamless travel were possible, more people would do it. Incidentally, Seat61 and DeutscheBahn’s timetable portal were my systems for sorting out through ticketing. Seamless IT helps. Perhaps in the same way that people don’t book their flights from airline websites, they use expedia, a one-stop-shop website for all European rail would encourage a lot more people to try it. @Jan – oops, yes. The information is USEFUL, but he is not political. @sklgjkljsla – comments now approved. Problem was I’d not checked WordPress in a little while to approve the comments. Generally though, I am happy to report that after 2 days looking into all of this, I have some progress to report. Some of the meetings I’ve had in Brussels were productive, and there are ways to act on this in a way I am happy with. Once I have the full details I will blog about them! Another problem with delays is finding out which trains you can use instead. Let’s say that you book an “Europa-Spezial” ticket through Deutsche Bahn for a journey from Germany to Sweden. The ICE or EC train then runs late and misses the ferry at Puttgarden. As a result, the train arrives half an hour late to Copenhagen, and you have now missed the X 2000 connection to Stockholm. As you have a through ticket, you have the right to continue with the next train to Stockholm. You check the timetables and find that there is an Öresundståg/Øresundstog train to Malmö which connects with a domestic X 2000 train to Stockholm one hour later. Thinking that you can use this connection, you board the train, only to receive a SEK 1000 fine for having no valid ticket between the middle of the Öresund Bridge and Malmö Central Station. In this situation, you actually have to wait for the next X 2000 train from Copenhagen to Stockholm (departing two hours later, increasing your total delay by an additional hour). As a passenger, you have to go to http://www.cit-rail.org/en/passenger-traffic/cit-documentation/ and download the document entitled “GCC-CIV/PRR” and read point 9.1.3 of the document: “Return to the starting point of the journey or continuation of the journey are only possible using the carriers taking part in the performance of the contract of carriage. They are to be under conditions comparable to the initial journey.” This point contains some very important information for the passenger: the Europa-Spezial ticket tells that you may only use the companies (Deutsche Bahn), (DSB) and (SJ). Departing from Copenhagen bound for Sweden, you are always using company on the Danish side of the border, regardless of whether you use an Öresundståg/Øresundstog service of whether you use an X 2000 service. However, at the Danish/Swedish border, the number changes: If you use Öresundståg/Øresundstog, then you begin using company (Skånetrafiken), but X 2000 is company (SJ). As your ticket doesn’t mention company , you may not use company anywhere during your journey. In Sweden, there is about a dozen of different numeric company codes in use, causing big confusion for the passengers. The numbers are printed on tickets bought outside Sweden, but they are not printed in official timetables or in information at the stations, and are not printed on tickets bought inside Sweden. Passengers are still required to ensure that they use a train which uses the correct company number. On several routes, there are multiple different services which use different numbers. This creates a big information problem for passengers. As most passengers buy their tickets in Sweden, someone who has bought the ticket outside Sweden won’t find anyone to ask for hel. In most other countries, all trains use the same company number, so you should be able to use any train in the event of a delay. How is this handled if you, say, have a ticket from Belgium to Lille? If you plan on taking a TGV, the ticket should contain the numbers of SNCB and SNCF. On the other hand, if you plan on taking a Eurostar train, you should find the Eurostar number instead (and also SNCB’s number in order to connect with the Eurostar train in Brussels, unless the journey begins in Brussels). What happens in this situation if a delay occurs somewhere along the route and you need to change from TGV to Eurostar or the other way around? @Michael – Mark Smith (Seat61) is on the same e-mail lists as I am, and while his information is useless, he is not willing to use the clout and network he has for political purposes. So there’s sadly no way to build much around him for the moment. @Karen – good. As for meeting Heunicke – I was given some information about differences of view yesterday between what DB has been saying, and what Heunicke has been saying. I’m going to write that up when I get a moment. The solution, IMHO, is European *public* rail service. A single, public sector organisation owning both network and operations, run in the public interest as part of the planned transition to a low-carbon economy. Somebody needs to take the initiative, and create the momentum needed. Then a network of organisations may be enough? We had a good show of people in Copenhagen when the last night train (for now) left København H last night, and the response to the cries of protest has been resonable. Thank you for writing up this list of points to do. I have a promise of a cup of coffee to talk about EU trains with transportminister Magnus Heunicke. Let’s see if it happens and if it does I’ll take your points with me. 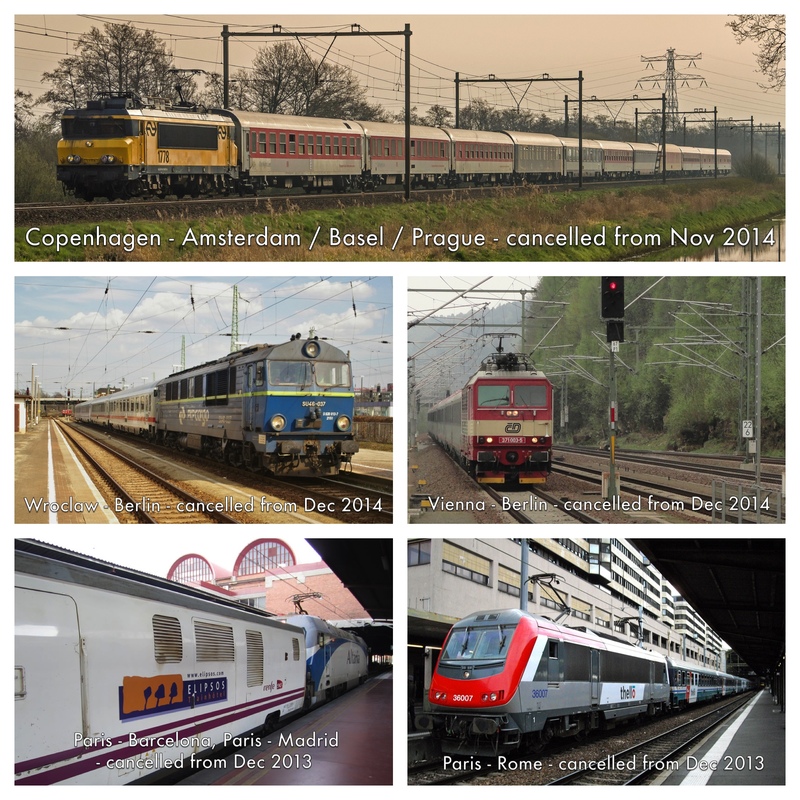 Great blog post – as a fellow rail enthusiast I agree that action is necessary (we’re still relatively spoilt here in Switzerland, but I’m worried about the decline in trans-European connections, continent-wide). One good person to talk to, if you haven’t thought of him yet, might be Mark Smith from the priceless seat61.com website. I think he’s quite well connected among rail travellers / long-distance rail enthusiasts…he might know of any existing lobbying and interest groups?